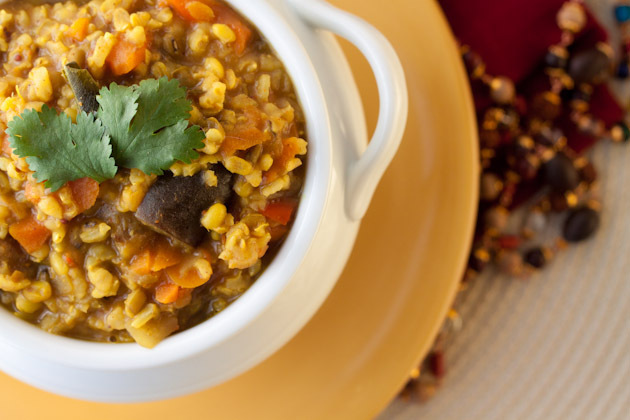 One-pot meals are the bee’s knees, wouldn’t you agree? The prep time is minimal, ingredients are simple, your kitchen doesn’t get all messy, and dinner is ready in under an hour. I like that. If that’s not enough, one-pot meals leave you with leftovers; and from the feedback you’ve left on the meal planning giveaway post, you love leftovers just as much as me! I’m glad we see eye to eye on leftovers… I think we’d make great real-life friends. Okay, so now that I’ve sold you on the whole one-pot meal idea, let’s get right to it. 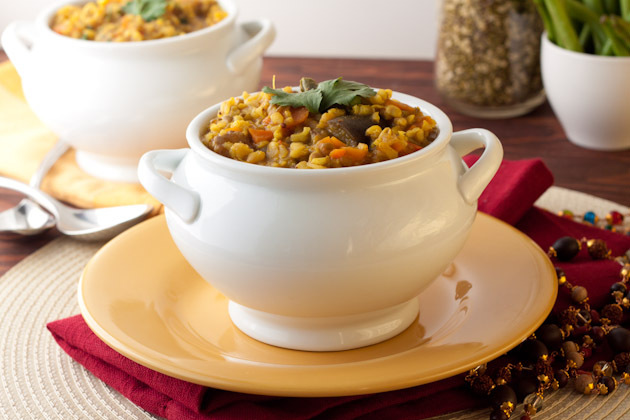 Today’s one-pot wonder comes all the way from India. Surprise, surprise! 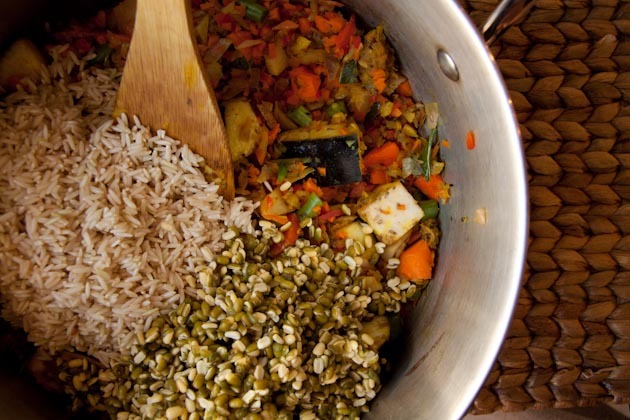 Indian cooking is heavily reliant on one-pot meals. The flavors are bold, the ingredients are simple, and the result is jaw-droppingly awesome. Yes, jaw-droppingly. The kitchens I visited in the South were very basic – many of them only had one or two pots and pans, a cutting knife, cast-iron grill for their breads, eating utensils, and metal trays. As a result, Indians have mastered the art of one-pot cooking. The meals I enjoyed during my time there were hands down some of the best I’ve ever had in my life. They had less than 10 ingredients, were made with love, and many of them were created using just one-pot! 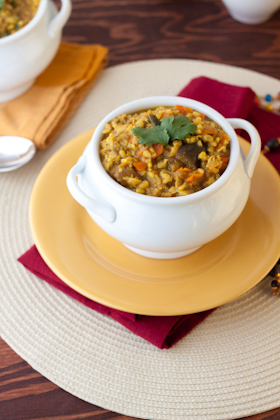 In today’s one-dish wonder, we’re whipping up a batch of Indian rice and lentils, also known as bisi bele bhath. 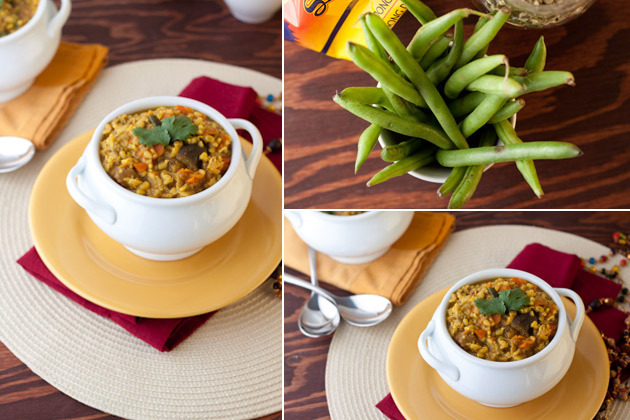 The direct translation of bisi bele bhath meals hot lentil rice. The name says it all, really. 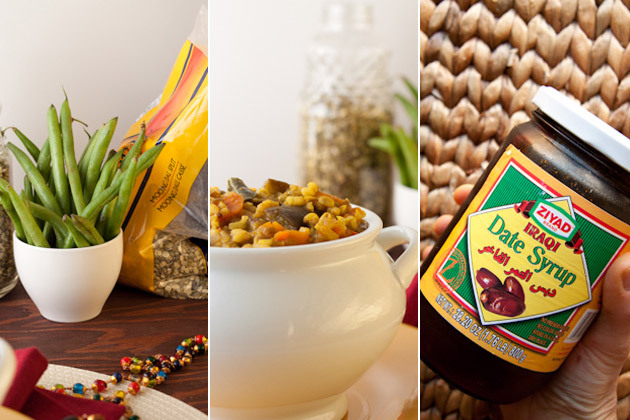 It’s naturally gluten-free, vegan, inexpensive, and delicious. 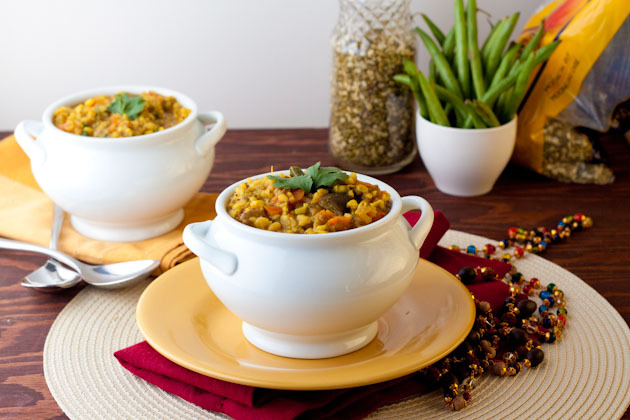 The traditional preparation of this dish involves the use of spicy masala, toor dal (a type of lentil that I wasn’t able to find at the grocery store) and vegetables. Spices like nutmeg, curry leaves and tamarind pulp (another ingredient that’s hard to find so I replaced it with date syrup) contribute to the unique flavor and taste of this dish. It is served hot and sometimes eaten alongside salad, papad or potato chips. For a healthier potato chip option, try pan-frying cubed potato in some coconut oil for about 15 minutes and dropping over top of your individual portion. So good. Instead of using store-bought masala, I opted to make my own and was happily pleased with just how easy it was. I also threw in some dehydrated coconut for good measure, South India style. 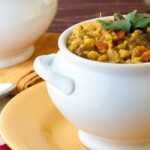 One-pot meal of spicy south Indian rice with lentils and homemade coconut masala. Melt coconut oil in a large cast iron pan on medium-high heat. Add curry leaves, mustard seeds, turmeric, ginger, garlic, and cumin seed. Cook until cumin seeds are brown, about 2-3 minutes. Add onion and salt, stir to combine and continue to cook until onions are translucent, about 5 minutes. Add beans, carrots, potatoes, red pepper and eggplant to the mix and cook for 1-2 minutes. Transfer vegetable mixture into a large saucepan. Add rice, lentils and water. Cover and bring to a boil on high heat. Reduce heat to a simmer and cook for 30 minutes, until rice is tender. Meanwhile, place all masala ingredients in a small cast iron pan. Cook on medium high heat until coconut has browned, about 3 minutes. Grind in a coffee grinder or small processor and set aside. Add homemade coconut masala and date syrup if chili's were used in the masala. Cover and cook for another 5 minutes. Remove from heat, stir in fresh cilantro and serve.
! don't handle my spice well, so I made the first batch with no chili at all. It was good, but lacked the kick! For the second batch, I tried it with 1 chili and it was perfect. Feel free to go up to using 3 chili's if you're the adventurous type. I'm pretty sure I'd burn my face off if I tried it. 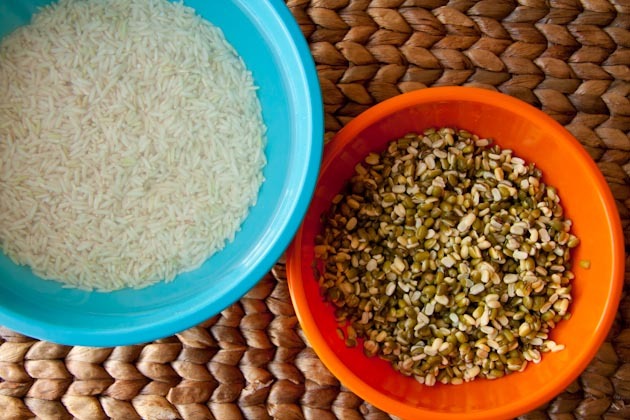 Soaking the rice and lentils made a huge impact on the digestibility of this dish. I couldn’t believe how easy it was on my tummy. Major win in my books! 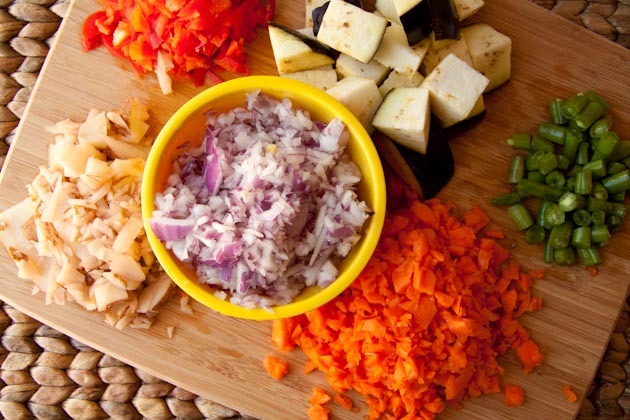 Feel free to mix and match your veggies for this recipe. I’ve added zucchini, celery, green peppers, fennel, Chinese eggplant, cabbage, cauliflower to the mix and all of it was downright delicious. Sauteing the garlic and ginger with the several spices is my favorite part about making most Indian meals. The spices are so fragrant! Once all of your veggies are coated in the turmeric mix, throw everything in a pot and let it cook away for 30 minutes. 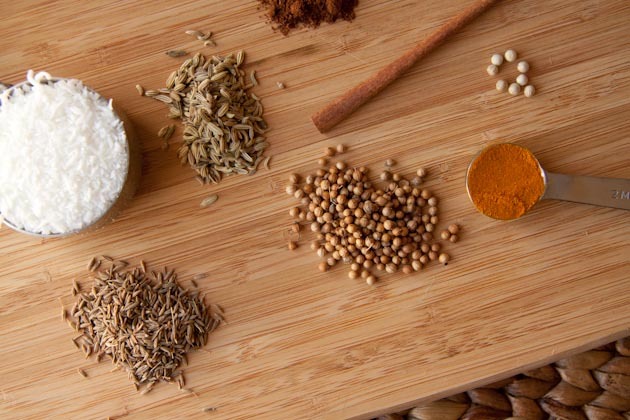 While your dinner is busy simmering, you can get started on the masala. I was intimidated to try making masala from scratch but it turned out to be really easy! You want to brown the spices to release as much as the flavor as possible. The cumin seeds will begin to bounce on the bottom of the pan, and the coconut will turn brown and release just the perfect amount of oil to prevent everything from burning. After 30 minutes of simmering, remove the lid and check on the texture of the rice. It should be soft and perfect! Add your homemade masala, stir, and return to the stove for 5 minutes. The longer you heat the masala, the spicier the dish will be. Add some cilantro, and you’re set. If you’re lucky like me and your boyfriend is now tired of eating Indian food, you’ve successfully prepared 6 whole meals for yourself. Hurrah for leftovers! 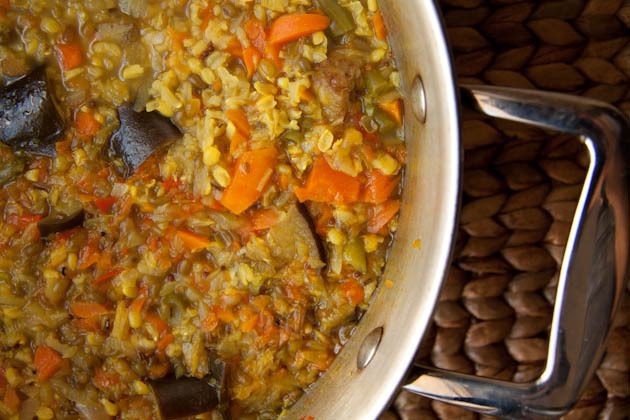 Do you have a favorite one-pot meal?